The Digital Transition: Our Agency’s Journey to Bring a Client’s Flagship Publication Online | Frank. We have been fortunate enough to work with The National Trust for Historic Preservation (NTHP) since the mid-90s on the creation and production of their flagship publication, Main Street News (renamed Main Street Now in 2009). 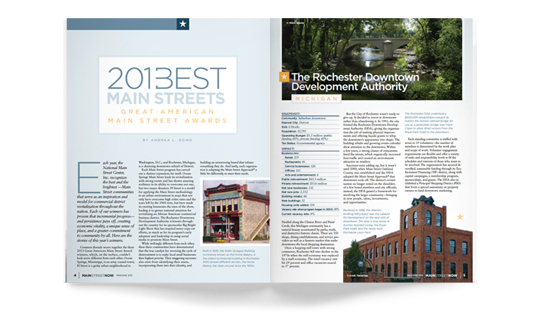 Main Street Now, up until last issue, was a bi-monthly printed publication that offered a wealth of information, resources, case studies and news on all aspects of commercial district revitalization to a member audience made up of Main Street Managers/Organizers throughout the U.S. They would use this publication primarily to share best practices and ideas to impact their local main street revival efforts. As we were finalizing the May-June issue, we began discussing with our Client the opportunities inherent in transforming the magazine from a print publication into a digital platform. It would allow the content to be more timely, the stories and content more interactive, and the publication itself would be as accessible and reachable as their reader’s nearest mobile device. As mobile devices are becoming more and more prevalent within society, the technology behind digital publications has greatly improved beyond static PDF representations. Today’s digital publications can feature video, custom animations, hyperlinking to external and internal sources, and even some social functions that allow readers to share favorite articles or quotes within a given issue with their network. 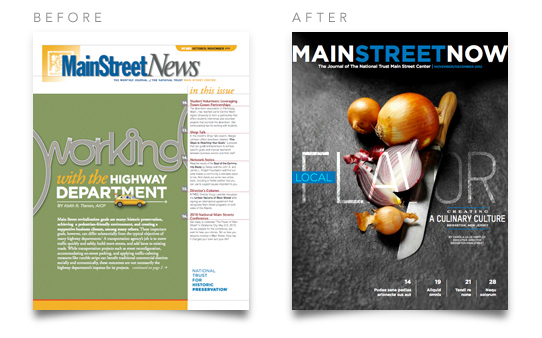 When planning began for the inaugural Main Street Now digital issue, we investigated several platforms and ultimately landed on ISSUU, the fastest growing digital publishing platform, which offers an intuitive interface, readership metrics, and a customizable reader platform. What is the optimal headline, subhead, and body text font size? What opportunities for enriched content (video, animation, or social media integration, etc.) can we include in the issue? What image sizes are preferred? 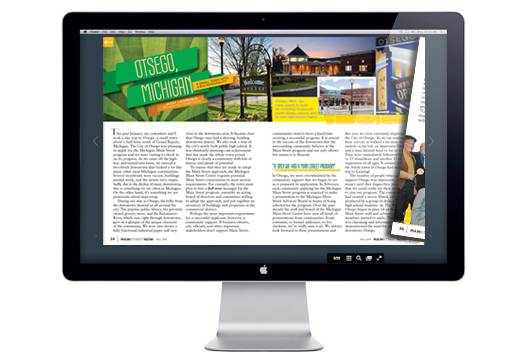 The transition to a digital publication from a print-publication often presents several challenges and it ultimately proved to be a successful journey for our Client and us. Implementing the transition for Main Street Now has allowed us to further explore the complexities – and advantages – inherent in digital publishing. While nothing will ever replace the feel and experience of reading a printed magazine, it has been pretty enlightening to see how far the technology has come. We’re excited to see what the future holds for this promising technology and where we’ll be able to take NTHP and Main Street News in the next 20+ years. ← Happy Holidays from Frank.